Registered Embossing Surface Texture provides a true to life floor comparable to natural stone or ceramic tile. 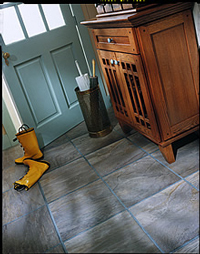 Differential Gloss Levels enhances the texture dimensions along with color coordinated grout. Add to this the Mohawk DuraLoc® Lift & Loc glueless installation system with a wide plank design and you have a floor that is beautiful and easy to install! Note: An additional 10% should be ordered to assure there is enough material to match grout lines.